Morristown Town Hall is located at 200 South Street, Morristown NJ 07963; phone: 973-292-6636. Photo: Colonel Jacob Ford Jr. House, ca. 1774, 230 Morris Street, Morristown, NJ. Photographed by Jack E. Boucher, photographer, n.d., Historic American Buildings Survey [HABS NJ-32], memory.loc.gov, accessed April, 2011. When, about 1710, word came to the settlement at Newark that iron ore was plentiful beyond the Watchung Mountains, a small number of pioneers struck out on a wilderness road to engage in a new industry. One group selected a site at the foot of the present Water Street in Morristown, in the small valley (now known as The Hollow), and named their new village West Hanover. Newcomers spread to the tablelands above and formed a ring of improved properties around a central green which later became Morristown Green. During the Revolution, when the demand for munitions tested the young industrial resources of the Colonies, no fewer than forty-five forges were operated in Morris County. In addition there were sawmills and gristmills on every sizable stream. The iron industry became the most important factor in the development of Morristown and neighboring communities. Washington led his exhausted army here in January 1777 for winter encampment in the Loantaka Valley after the victories at Trenton and Princeton. He returned with his troops to pass the winter of 1779-80. 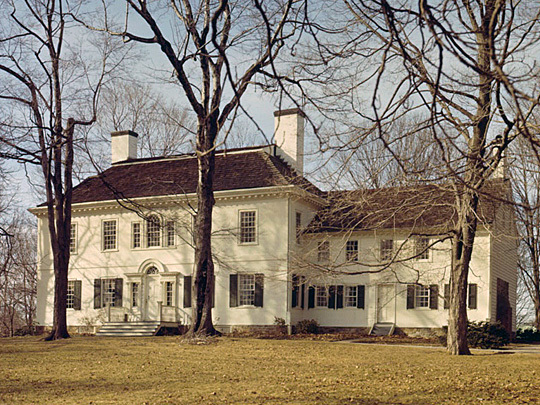 The men were quartered in crude huts in Jockey Hollow, while Washington made the Ford House his headquarters. With his army's condition even worse than it had been at Valley Forge, the commander-in-chief established a quota system for levying supplies upon the various counties. He wrote to a friend that the men sometimes went "five or six days together without bread" and that at one time "the soldiers ate every kind of horse food but hay." When the iron industry diminished before Western competition during the nineteenth century, Morristown became largely a residential and shopping town. Thomas Nast, the cartoonist who created the Tammany tiger and pilloried Boss Tweed, made his home here. Bret Harte and Frank R. Stockton lived in Morristown for a time. Rail connections between Morristown and Newark, over the tracks of the Morris and Essex Railroad, were established in January 1838. Today,  approximately 1,200 persons commute daily to clerical jobs and executive positions in the cities of the metropolitan district, while a number of outsiders come to Morristown for work. It was once the boast of Morristown that within a radius of one mile from the Green lived more millionaires than in any other equal area in the world. It may not have been true. But this Colonial town is still marked by obvious signs of the extreme wealth brought here in the mauve decade and the years following. Many of the millionaires long ago left for the more exclusive hills of nearby Bernardsville, Bedminster, Peapack, and Far Hills, where they could escape the annoyance of heavy automobile traffic. A number of the great houses were emptied during the depression, when the second generation was unable or unwilling to maintain them. Homes that cost hundreds of thousands were torn down to escape the burden of taxes, or sold at bargain prices (in one instance for less than the cost of the greenhouse) and remodeled on a smaller scale.